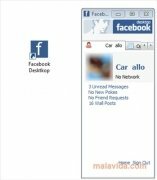 Do you usually use Facebook? 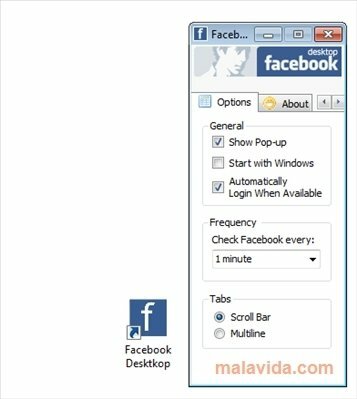 Have you always got a tab of your browser set aside for that social network? 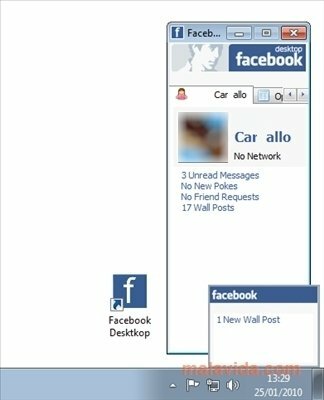 Then this Facebook Desktop will really come in handy, a program that will let you know from your desktop if you have new updates in your account. - New messages on your wall. - Notifications of new friends. Facebook Desktop doesn't really allow you to change hardly anything on Facebook, but it can come in very handy to let us know when there is movement in our account, so that we can access it at that moment. 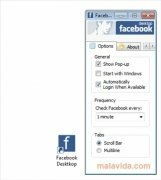 Facebook Desktop will stay open in the system tray to check every minute if there is any new activity on your Facebook, but if we open it, we'll find a summary and the links necessary to organize our account on this social network. It's necessary to have .NET Framework 2.0 installed and a ZIP compatible compressor.